Jewish Art Salon: Opening Reception of "It's A Thin Line - The Eruv and Jewish Community in New York & Beyond"
Opening Reception of "It's A Thin Line - The Eruv and Jewish Community in New York & Beyond"
Jewish Art Salon Members Ben Schachter and Yona Verwer are two of the four artists featured in this major exhibit at the Y. U. Museum. It's A Thin Line - The Eruv and Jewish Community in New York and beyond. Curated by Zachary Paul Levine. Exhibit on view till June 30, 2013. The exhibit brings together maps and memorabilia from their collection and contemporary art installations that reflect upon the subject including New York-based artists Elliott Malkin, Ben Schachter, Yona Verwer and Justin Stewart. 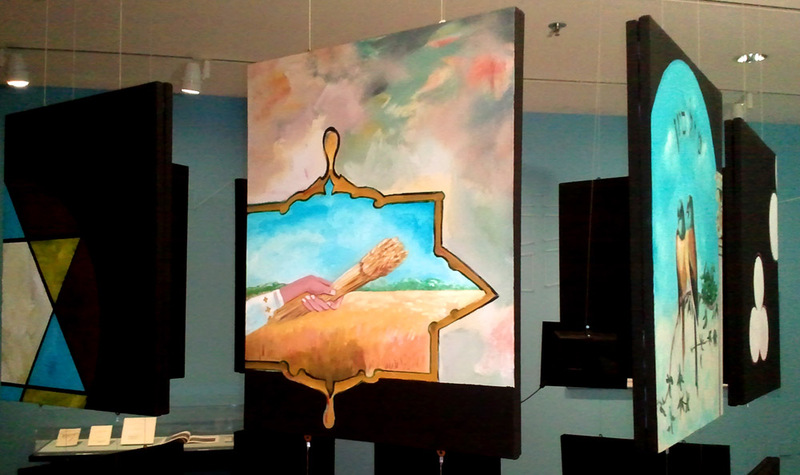 Politics of the Eruv”, ending December 14. "Eruvim are symbolic Jewish enclosures. Eruvim protect Orthodox Jews from transgressing the prohibition against carrying on the Sabbath, which is considered a form of work. These enclosures extend what is considered private space into the public sphere and are all but invisible. As a contemporary artist, I see these structures as drawings in space. These paintings are acrylic and thread on paper (20x30”) with the exception of “Sixteen Eruvim I’ve Walked Through,” which is "acrylic and thread on canvas (40x60”). "My installation explores the impact that the lack of an eruv on the Lower East Side has on families with young children and the infirm. It draws attention to the fact that, for many, not having an eruv significantly detracts from the attractiveness of living in the neighborhood. Having spent many a Shabbat on the Lower East Side, I am aware that the physical boundary of the eruv has become a spiritual boundary as well. It excludes women from fully participating in Jewish life and creates a male-dominated synagogue community. This installation shows details of Lower East Side synagogue interiors, which cannot regularly be seen by many in the community, because there is no eruv. The images are a metaphor for what the women & children miss out on: connection to the community. Video monitors inside the structure feature quotes by LES residents addressing this issue." An Eruv is a border, usually made out of string or wire stretched on top of or on telephone or light poles, which symbolically encloses a neighborhood or a city. It allows Jews to accomplish one of the most basic activities on the Sabbath, which Jewish law otherwise prohibits on the Day of Rest: Carrying. An eruv makes it possible for people to carry keys, push a baby carriage or hold a baby, or bring food to someone’s home. Celebrated writer and thinker Blu Greenberg (On Women and Judaism: A View from Tradition) will take part in a program, co-presented by the Jewish Orthodox Feminist Alliance, focusing on the impact of the eruv on the lives of women and families within the Jewish community. The YU Museum will partner with Yeshiva University’s Center for Jewish Law and Contemporary Civilization at Cardozo Law School and the Straus Center for Torah and Western Thought to present a panel discussion among top legal scholars using the eruv as a window into church-state issues and the relationship between law and community building. A series of in-depth tours will be offered during the run of the exhibition, featuring Zachary Paul Levine, curator of It’s a Thin Line, and Rabbi Adam Mintz, one of the foremost historians of the eruvin America and the exhibition’s academic adviser.